So you want to live your dream but don’t know where to start? The place you start is right here and right now. It’s about making a decision to live your life in a way that brings you happiness. One thing I often hear from people is that they don’t know what their dream is so they are comfortable in the space they are in. If you love the idea of living your dream, then start today. Grab a journal, paper, your phone or anything to put your thoughts down and start writing. What makes you excited in life? What will get you to wake up every morning and greet the day with open arms? This step is about formulating ideas. Maybe you love your job and you can create more purpose out of your current profession. Maybe you have wanted to make a location change but you have been too scared. Start to write down the things you want in your life. Jot down random thoughts like freedom, abundance and love. Formulate bigger ideas like “a job I feel fulfilled in and I make a salary to cover my needs and wants and “I am in a relationship where my physical, emotion and spiritual needs are met”. You can develop these ideas into a vision board or journal entries in order to develop and manifest them into your life. What are your passions in life and how can they be used to create your purpose? Once you have a general idea of where you want your life to go, create some goals. You want to make sure your goals are SMART: specific, measurable, attainable, realistic and timely. You can create a goal for each area of your life you want to shift and then create smaller action steps you are going to take to achieve your goal. An example of a goal would be: Complete one triathlon by March 2015. Smaller action steps would be: sign up for race, put together and follow a workout schedule, purchase biking equipment and put up motivational messages around the house to keep me engaged. 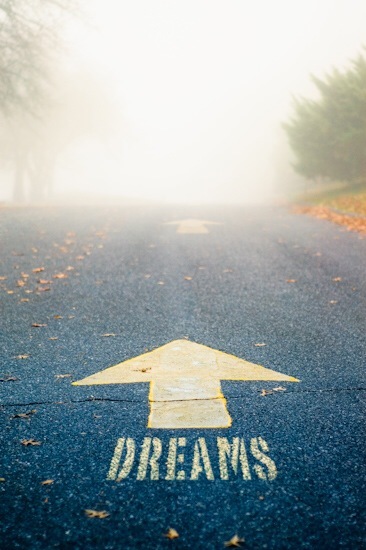 What goals will you set for yourself in relation to your dreams, passions and purpose? Do something to reward yourself for achieving your goals and living your dream. How do you best reward yourself for your achievements? Living your dreams will feel good in and of itself. You will end up feeling more connected to yourself and others. You will receive reward from the emotional freedom you will feel from living your authentic life; however it is important to reward yourself in ways that work for you. When I quit my full-time job, I bought a purse I had been eyeing for a long time. It was my reward for stepping outside of my comfort zone. The purse has become the symbol of my shift towards pursuing my dreams. What have you been eyeing that can be a personal symbol for your change? What emotional rewards are you looking to gain by following your dreams? Interested in setting your sights onto something bigger but need help? Call me or text me at 954-258-8845 for a free 15 minute consultation on manifesting your dreams. I can help you develop a vision, set goals and hold you accountable to what you have set for yourself.